Templetown on the Hook Peninsula takes its name from the Knights Templar who were granted large sections of land in this remote area of south-west Co Wexford shortly after the arrival of the Anglo-Normans in Ireland. The Knights Templar were a religious, monastic order formed in 1118 to defend the Kingdom of Jerusalem and to protect Christian pilgrims during the Crusades. Their official name was the Poor Fellow-Soldiers of Christ and of the Temple of Solomon. The Templars arrived in Ireland in September 1220, and their foundations in Ireland included the Templar church in Templetown, Co Wexford, Clontarf Castle, north of Dublin, Baldongan Castle near Skerries, and, perhaps, Askeaton in Co Limerick. They continued to hold vast estates across Europe until King Philip IV, who was heavily in debt to the Templars accused them of heresy and sexual misconduct. Many of the Templars were arrested and Pope Clement V disbanded the order. Like their counterparts across Europe the Templars in Ireland were ruthlessly suppressed amidst bizarre allegations between 1308 and 1310. The Templars in Ireland were arrested on 2 February 1308 and held in Dublin Castle. Their estates were seized by King Edward II, who leased them to close allies and associates. Five inquisitors, three Dominicans and two Franciscans, arrived in Ireland in September 1309 to oversee the trial. The trial began on 6 February in Saint Patrick’s Cathedral, Dublin, and lasted four months, concluding on 6 June 1310. The historical records of the time do not show any evidence of the use of torture on the Knights Templar in Ireland. The last Grand Master of the Knights Templar, Jacques de Molay, was burnt at the stake in 1314, on an island in the River Seine, in front of the Cathedral of Notre Dame in Paris. The estates and property of the Knights Templar were given to the Hospitaller Order of Saint John of Jerusalem, also known as the Knights of Rhodes and later the Knights of Malta. During my recent visit to New Ross and the Hook Peninsula, I missed out on the ruins of the Templar Church in Templetown. It was late in the afternoon, but I visited All Saints’ Church, the Roman Catholic parish church nearby. 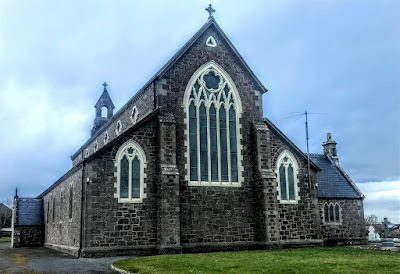 The church was built through the efforts of and financed by Canon William Synnott (1834-1911), Parish Priest of Templetown (1886-1911) and Precentor of Ferns. The foundation stone was laid on 5 March 1896, and the church was blessed by James Browne, Bishop of Ferns, on 20 May 1899. 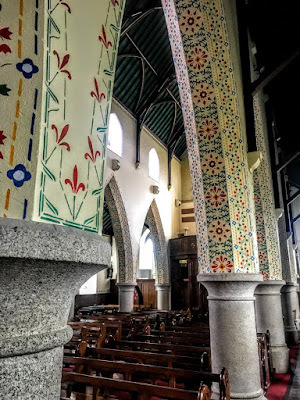 It was designed by Michael Power, architect and builder, of Saint Kearns, Tintern, Co Wexford, whose other works include nearby churches in Poulfur and Duncannon. All Saints’ Church can be compared with Saint Alphonsus’s Church, Barntown, designed by Augustus Welby Northmore Pugin (1812-1852) and built in 1844-1851. Pugin conceived of Saint Alphonsus’s Church, Barntown, in the parish of Glynn, as a complete Catholic parish church and is his only complete expression in Ireland of the small village parish church. Some writers suggest the church in Barntown is a finer version of the simplest of all Pugin’s designs, Saint Augustine’s Church in Solihull. However, most historians say Pugin’s design for Barntown was based on Saint Michael’s Church in Longstanton, 10 km north of Cambridge . The design of All Saints’ Church in Templetown shows Pugin’s continuing influence on the design of Roman Catholic churches in Co Wexford and the Diocese of Ferns throughout the 19th century. This is a six-bay double-height Catholic church, built in 1896-1898 and opened in 1899. It is built on a rectangular plan with a six-bay double-height nave opening into two six-bay single-storey lean-to side aisles. The architectural features of this church include cut-granite coping to gables on cut-granite gabled corbel kneelers including lichen-covered cut-granite coping, cut-granite gabled corbel kneelers, a cut-granite buttressed gabled bellcote, quatrefoil windows in the clerestories, trefoil-headed lancet windows in the side aisles, an elegant pointed-arch East Window in the chancel, hood mouldings, a pointed-arch entrance door at the west front and timber boarded double doors. Inside, there is a timber panelled choir gallery at the west end on a half-octagonal plan, a tiled central aisle, timber pews, pointed-arch arcades on cut-granite drum pillars, a white marble stepped dais at the sanctuary and a white marble high altar below the stained-glass East Window. The pointed-arch braced collared timber roof sits on cut-granite beaded corbels with pointed-arch wind braced rafters. 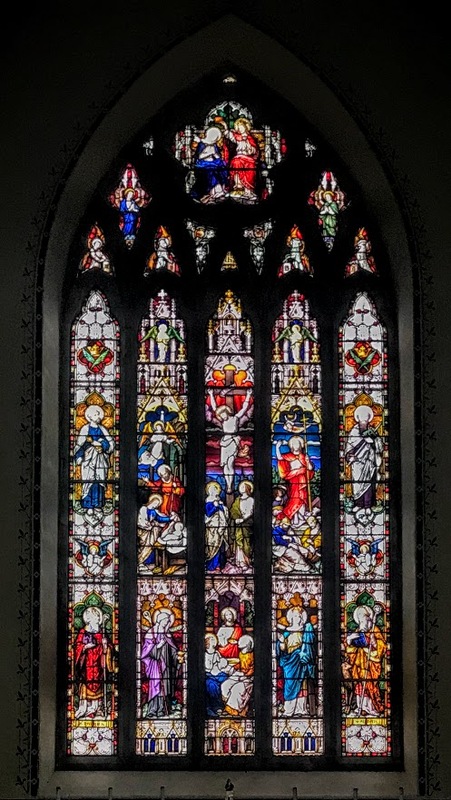 There is a stencilled ceiling, carpeted stepped daises to the side altars, timber panelled confessional boxes in the side aisles, Gothic-style timber Stations of the Cross, and ‘cathedral glass’ windows. 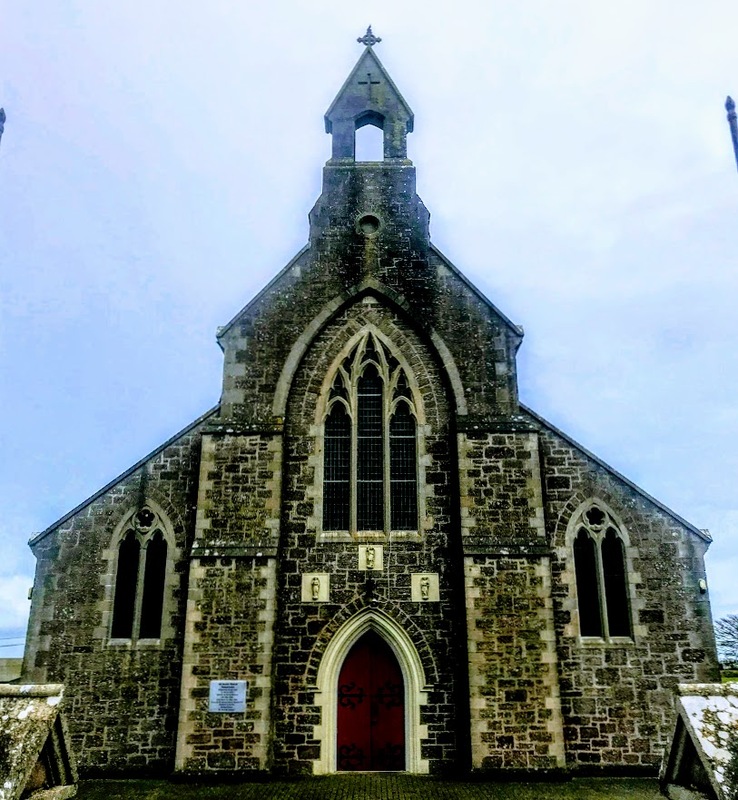 The church has well maintained, with the elementary form and massing surviving intact, along with substantial quantities of the original fabric. It was renovated after the liturgical reformed introduced after Vatican II, when the sanctuary was reordered and the High Altar modified. 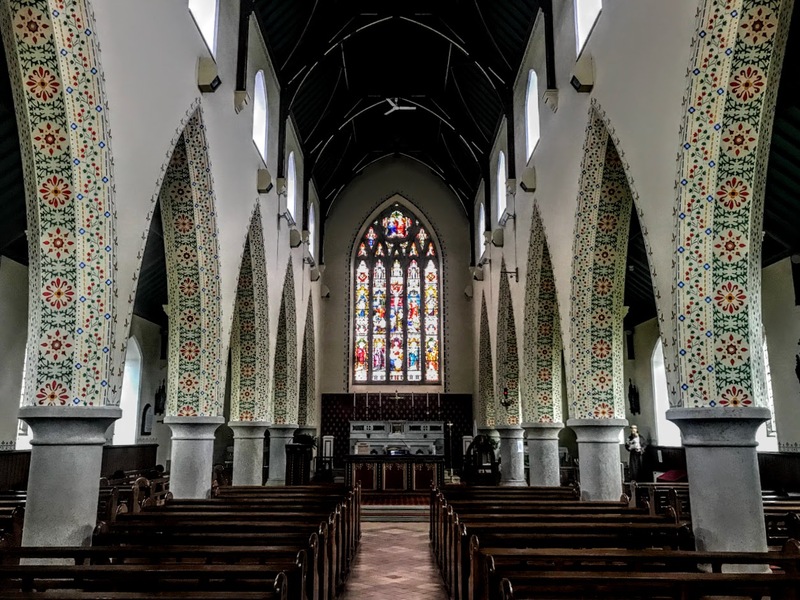 But since then the church was tastefully restored in 1998 through the generosity of the late Miss Alice Cooney of Killoggan. It forms part of a neat self-contained group with the adjacent parochial house. 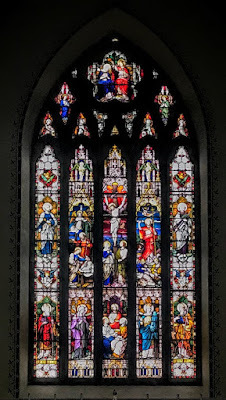 The church is attributed to John Semple (1801-1882) of Marlborough Street, Dublin. The tower was inscribed with the signature of Edward Lymbery of Fethard Castle and the date 1847. Nearby too are the ivy-covered ruins of a Roman Catholic chapel built in 1794-1795 and closed in 1899 after All Saints’ Church opened. 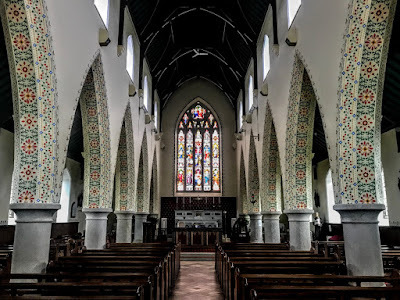 This chapel, which predated the 1798 Rising in Co Wexford, was built through the efforts of the Parish Priest, Father Anthony Broaders, who died in 1789. A monument to one of his successors, Father Edward O’Flaherty, says he built ‘three chapels, two presbyteries and two schoolhouses’ in Templetown before he died in 1835.